Christmas Is Coming! And we’ve prepared an amazing holiday deal for you! We know that all you designers will be starting to plan the design of your personalised Christmas cards, invitations, wallpapers and everything else. So just to help you guys out we have a bunch of Christmas templates. Hope this collection will help you to get into the festive spirit. * Delivered as an instant download, after completing your purchase. * Can be used for both commercial and personal projects. * Cannot be re-sold or shared in any way. 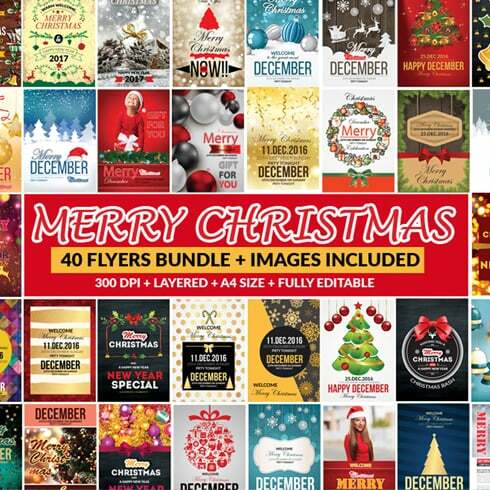 Definition of a Christmas Bundle: 65 Amazing Templates + 26 Elements deal? If you are a graphic designer focusing on numerous assignments simultaneously, you comprehend the importance of the whole bunch of design elements at hand. Trying to find those elements separately, you may spend much cash and time consequently. To obtain all the desired components in one pack, we suggest experimenting with graphic packages. A bundle is actually a collection of digital components needed for graphic design, valued for thousands of dollars, yet sold at a discounted price tag for a short time. Why are Christmas Bundle: 65 Amazing Templates + 26 Elements cost-effective? For a single design project, you will need a lot of components – a font, a few illustrations or photos, some icons, and so on. If you’d want to shop for every one of them separately it can cost you a lot of money! And so, that’s the reason knowledgeable web designers look for graphic bundles to purchase. They allow ending up with a big handful of different graphic elements for a modest price tag. The assortments of elements accumulated into a graphics package deal are usually categorized in accordance with their purpose or kind. There may be deals with infographics, business card templates, wedding invitation templates, icons and mockups, etc. You may also manage to find graphic deals designed for Christmas, NA, Christmas, or Christmas. 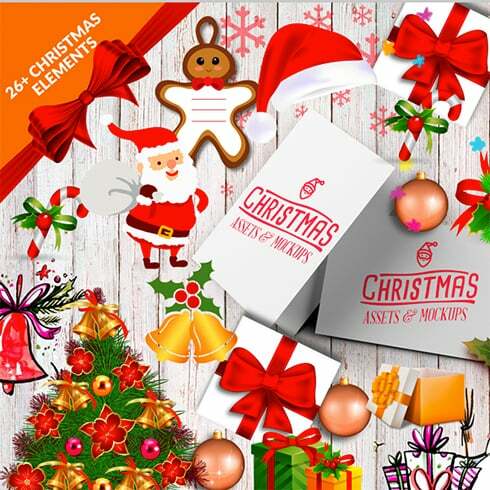 Any approaches to make Christmas Bundle: 65 Amazing Templates + 26 Elements even more cost-effective? Would you like a 5% extra price reduction on any selection from MasterBundles.com? Well, it is not that hard. All you have to do is simply share the web page with a bundle on social network (Facebook). MasterBundles offers you a big variety of different items. We market not only graphics packages but also about 20 other different types of products. Fonts, WordPress themes, mockups, icons, photos, illustrations, presentation templates and a whole lot more – on the MasterBundles you’ll be able to locate all the products and solutions, essential for a design project creation. A different package suitable for photo designers as well is assigned to photo bundles. Here you will discover lots of solutions for photo manipulation. If you need PS actions, photo overlays, Lightroom presets, or other tools for dealing with pictures, you’ve come to the right place. The watercolor bundle is known to be the most beautiful trend in creative desgin. Handcrafted by artists on the paper, the images get digitized and added in a package as design templates for projects. Watercolor elements are excellent for DIY, wedding invitations, greeting cards, quotes, blogs and posters. All illustrations are hi-def and ready to print or use digitally. Living in the online and digital era, we spend literally half of our lives within social media platforms like Instagram. Regardless of what purpose we strive to achieve by using this network, we wish to stand out in a crowd amid a large number of alike profiles. Fortunately, with top quality Instagram templates offered at MasterBundles.com, you don’t have to spend eternity building the outstanding appearance of your Instagram page. One of many packages will surely help you focus on the aesthetic appearance of your Instagram page. If you need infographics for the upcoming business presentation in any kind of market sectors from social networking and marketing to medical care and schooling, the package deal is right what you have been looking for. Using the infographics bundle you will find yourself saving your time which can be essential in terms of productivity. Every component is available in a separate file that may be customized in Powerpoint, Keynote, Photoshop or Illustrator. If you feel as if you have lost track of time when researching various resources and elements for your own design jobs, it is high time to learn more about MasterBundles. It is a platform offering the most in-demand tools (watercolors, presentations, graphics etc.) for web designers, marketers, and developers at an affordable price for a short period of time. What’s more, you can use coupons and promo codes for particular design deals. In order to not miss significant information about the upcoming promos, we advise following our blog and subscribing to the email newsletter.